Mon - Fri.: 7:45 a.m. - 3:00 p.m. The Lake Erie College of Osteopathic Medicine’s Institute for Successful Aging invests in patient care through ‘revolutionary’ device. History Made! A.T. Still Bust Unveiling!! First-year medical students from LECOM’s Bradenton, Fla., campus recently visited the state Capitol for Osteopathic Medicine Day. Sponsored by the Florida Osteopathic Medical Association (FOMA), the event allows legislators to meet leaders of the osteopathic profession. LECOM's participants included Robert George, DO, Associate Dean of Academic Affairs, and students Nicholas Marburger, Taylor Kann, Jason Johnson, Marie Bergmeyer, Anthony Philips, Christina Mesoraca, Alexandra Girardot, Anthony Lahood, Matthew Sturdivant, Karim Al Turk, Joshua Lung, Sarah Manners, Ashley Gabriel, Jerin George, Joseph Haider and Salvatore Grasso. Get ready to run/walk for oral cancer awareness! Kudos to ATSU-ASDOH on receiving the Gies Award for outstanding innovation! And the winner of Best Magazine (Multimedia) GOLD at AACOM’s 2014 Excellence in Communications Awards Program is ... Still Magazine online! SM online will be recognized at the Marketing and Communications Advisory Council Meeting being held April 4 in Washington, D.C., in conjunction with the 2014 AACOM Annual Conference. We couldn't be more humbled! ATSU community, there is still time to help find a name for ATSU-SOMA's Virtual Community Health Center and have a chance to win $100 gift certificate to the Apple Store or Matthews Books. Submit your entry TODAY to vchcnames@atsu.edu. Deadline for submissions is March 17. Read about ATSU's new dental clinic in St. Louis! The Missouri School of Dentistry and Oral Health is seeking applicants for the position of Learning Facilitator. What's new on the ATSU website? Check out the new diversity webpage. Read on! Museum of Osteopathic Medicine.The Museum of Osteopathic Medicine Gift Shop offers a selection of hard-to-find books on Andrew Taylor Still and osteopathic history. We also carry a wide variety of prints and gift items with an osteopathic theme, such as D.O. caduceus bookmarks, nervous system T-shirts, and "My highest Ambition" Auto Sun visors. Many of these are our own designs and are not available elsewhere. Kudos to ATSU's Arizona School of Dentistry & Oral Health on their recent award for outstanding innovation! Check out ATSU-SOMA's innovative project, the Wall of Teaching Cases! Help us select the theme for OMED 2014 in Seattle. Visitwww.facebook.com/americanosteopathicassociation and 'like' your favorite theme in the gallery. página: A 2300 personas les gusta esto. Read more about the Strategic Plan for Research in a special report by Brian F. Degenhardt, DO, and Paul R. Standley, PhD, published in this month's issue of "The Journal of the American Osteopathic Association". To equip students with the knowledge necessay to accurately interpret scientific nutrition studies and be able to identify which studies are based on scientific evidence and wich are not. Provide the physiotherapist descriptive knowledge in neural anatomy and palpation as well as neruomechanical necesary for the proper manual processing of the pathologies of this complex sistem..
TEACHERS: Rosario Ariza, Graduate in Physiotherapy, Teacher in Bobath International acredited by (Association INternatiional Bobath Instructors) IBITA. She is Professor of the course in Concept Bobath in the Rey Juan Carlos University. She is Professor of Physiotherapy in the Francisco de Vitoria University, Spain. She is Professor in the Course "Diagnosis and treatment of adult people with neuroogic injuries. Bobath Concept." She is Professor of Physiotheraphy in the Complutense Madrid University and the Pontificia de Salamanca University. If you want to send us your scientific study about osteopathy or other clinic´s sciences, Learn how to do it! HOSPITAL OF MOLINA, MURCIA, SPAIN, OPEN A OSEOPTHIC CLINIC DEPARTAMENT IN COLLABORATION WITH THE E.O.M. The Advanced Care Clinic is the first of its kind in Arizona. This 10,959-square-foot, state-of-the-art clinic provides comprehensive care for individuals with complicated oral health needs or medically complex conditions including, but not limited to: cancer, cardiac disease, renal disease, bleeding disorders, physical disabilities, and developmental disabilities. Did you know...The Orthodontic clinic services include surgical orthodontics, braces, Invisalign, Lingual braces and more. Call 480.248.8132 to schedule an appointment. is a widely established institution in the field of training of health professionals since its inception has firmly dissemination of knowledge that contributes to professional Enrichment physiotherapists. There have been many professionals who have trained with us for over fifteen years, this trust is what has driven us to continue programming health training activities of most interest and to establish training agreements with professional associations, and educational institutions and national health international. Write the work offer with all details. The EOM is an Acredited Center for Canadian Manual Osteopathy Examining Board. If you are dean, rector,... and want to offer our courses of osteopathic medicine(Master, C.O. and D.O.) in your college, university, ... for physiotherapists, physical therapists, kinesiologist, or other professionals in sciences of health. THE TITLES OF E.O.M. ARE HOMOLOGATED IN THOSE COUNTRIES IN THE WHICH THE E.O.M. IS PRESENT. Recognized by the Brazilian Association of Osteopaths Physiotherapists in Collaborate with COFFITO. Convention of the EOM hospital in Brazil for patient care and practices of students in recent years training. The EOM-Brasil, through its country director, Rogerio Queiroz, has made several agreements of cooperation with municipal hospitals dependent Campinas (Sao Paolo) and Rio de Janeiro. In the aforementioned hospitals, departments are mounted Osteopathy professionals guided by EOM, currently performing more than 500 visits per month, is expected to be about 1,000 capacity acts of osteopathic treatment monthly. To stay clinic in Brazil. All students of the EOM of either American or European headquarters, can use this service allows them to stay in clinic 20 or 30 days, have a practical background and contact with the reality of physiotherapists and osteopaths, students and graduates EOM in Brazil. The program of supervised professional practice of osteopathy (PPPSO) is offered to students in training or trained by the Madrid School of Osteopathy from anywhere in the world, together with the city of Campinas and the Complexo Hospitalar Ouro Verde, department Osteopathic Osteopathic School of Madrid in this hospital. The presence of EOM accompanying osteopathic evaluation and treatment, stimulating at all times osteopathic reasoning. Supervised practice creates favorable conditions necessary for students to organize their knowledge and integrate all the theoretical content they have acquired during their training. Besides being able to witness the evolution of patients and observe their improvement, there is also the availability of metering devices as baropodómetro, and pressure algometer box position to verify the results of treatment in concrete. (II) Providing the public who do not have financial resources, a high level of care at no cost, thanks to the contributions of the council of the city of Campinas and the London School of Osteopathy. The Ouro Verde Hospital Complex is located in the city of Campinas and predominantly caters to people with few resources. Patients are referred by medical specialties and have wide range of diseases and symptoms, enriching learning opportunities. (III) Research Development. The PPPSO is structured for research in osteopathy demand, by being in a public hospital with a high demand of patients (treated with osteopathy are about 700 patients a month, even our maximum capacity is 1,000 per month). Pupils throughout the school who are interested in scientific research can develop protocol and send it to the hospital to the outpatient team perform in the manner prescribed. Section in your hospital by our students who is in clinical practice in the last year. We put more hospitals soon. In these hospitals, there are osteopathic departments, the osteopathy students practise with true patients, the E.O.M. teachers lead to them. These hospitals attend to more of 700 persons each month. Osteopathic Medicine as a treatment and medicine system, using the official terms of the Medical Subject Headings, has started along the thorny path towards identifying the true therapeutic capacity of the techniques and protocol it proclaims. 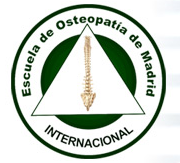 With the firm intention of collaborating towards the cause, the Madrid School of Osteopathy (Escuela de Osteopatía de Madrid - EOM), member of the Scientific European Federation of Osteopaths, has been developing its Research, Development and Innovation Department over the last few years. 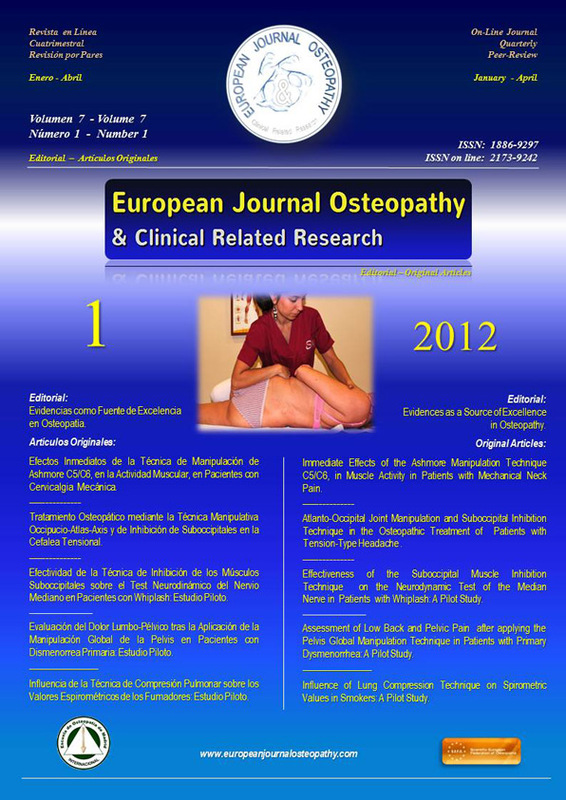 Our new Journal online: is the new format of the ancient osteopathic journal "Osteopatía Científica" (Scientific Osteopathic) edited by Elsevier. The course is aimed at teachers of Physical Education and Music in Elementary and Secondary students Cycle Sports and Physical Activities, the specialty of teaching in PE, School of CC. Sports, other teachers and the world of dance.. This course aims to contribute to these artistic practices are accessible to a greater number of people and the need of a culture every time more participative. that offer capacities to allow the individuality and group transformation, that everyone are creative, that dance must be accessible to all the world. 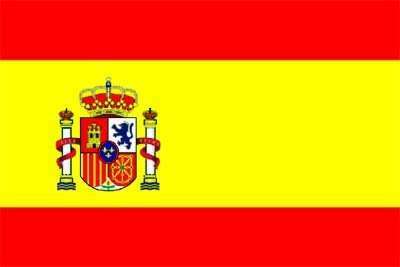 Comunitary Dance born like a meet place, a necesity of create an cultural share place.Espacios Generate participación culture. With a focus basis in individual and colective rights, we places the comunitary practice dance in the creation of a dance culture for all, having in consideration the diversity, the contextt, the necesities of expression and the socioeconomic reality and cultural of the collective more distant of possibilities of share. Through by the course the participants be able to cuestioning their artistic and pedagogic practices and discover news perspectives about the realities of art and artistic sense in relation with the current society. Provide herramientas of movement that sean y danza accesibles to all sorts of personas. Conocer el origen de la danza comunitaria, así how sustainable principles, values ​​y philosophy. Understand how to attach it Danza Comunitaria practice abierta actuación different fields, by means of different proyectos del análisis. Impelling them to claim y derechos y individuales collective participación, expresión acceso y, en el del Mar. Cultural Diversity promoting it. Desarrollar una critical conscience about it calidad en la danza de la communitarian practice, teniendo en cuenta en el el ambit art that is framed them aportaciones y la sociedad. Crear Espacios the exchange of experiences as conocimientos y medio de la facilitator Tarea del profesional with different groups of recipients. Acquiring para la concepción herramientas y desarrollo of proyectos. Introduce methodologies for la danza de la comunitaria practice. Larger el conocimiento about proyectos en el area del arte, el desarrollo y la culture, both national and international level. His identity pushes the barriers of theatrical creation acting as artistic platform for contemporary artists and dancers with and without specific support needs. Its components contribute to the cultural landscape a new vision of dance not only for its positive social impact if not for its artistic value. Work from the collective creation in dance and visual arts, engaging and valuing the artistic contributions of its components. The seminar will focus on the terms of community and diversity as a contribution to the evolution of the art. Will deepen the concept of collective creation from different perspectives: from choreographic practice, working from the model and from an egalitarian structure. Collective creation of art contains essential elements that sometimes takes a back seat as they are, the autonomy, integrity and development of the artist's identity. In this model all people, regardless of their support needs are included. Valuing their artistic contributions cease to be mere consumers becoming creators. Provide dance and movement tools that are accessible to all kinds of people. To study the generation of new technique that part of the group and the individual. Encourage the creation of new proposals for participation in the arts. Offering a new vision of dance based on the value of collective creation and not categorization. Highlight the importance of different communication systems working with heterogeneous groups. Show the importance of diversity and humanity in art as a working model. in different areas and have, in some way, be present in people's daily life. We must take into account the great influence that the body has in mind, as the mind has on the body. Related to this, we check every day to develop various motor difficulties, emotional and relational in people, which can be a problem that can help solve promoting conscious use of our body as a tool of expression and communication, well as maintaining and improving our quality of life, as a resource in the field of therapeutic and rehabilitation ... in this way we make the body becomes an element with constant and natural presence in our daily activities, both professionally and personally. Ultimately, our intention is to convey that the body movement and through this communication are essential for living holistically. If you of your institution wants to offer the courses of IMAS. Representatives from Brazil, Spain and Chile of the School of Osteopathy of Madrid (EOM) made ​​an official visit to the American Osteopathic Association. We've been meeting with leaders of A.O.A for the crediting of Osteopathic schools in the United States, with the editor of the scientific journal of the AOAm and the person making the bridge with the International Alliance of Osteopathy. The visit was very fruitful and will soon publish the fruits of it with names and photos. COLLABORATION KINESIOLOGY ASSOCIATION OF BUENOS AIRES (ARGENTINE) AND E.O.M. There are few quality publications about the shoulder and limbs in general, in osteopathic medicine. This work represents a different outlook – a new current of osteopathy from another perspective. TEACHERS: Mar Echevarria, Physiotherapist, especialist in equine rehabilitation. This course aims to train and update professionals in physical therapy intervention for adult and pediatric patientss with pulmonary disorders from a practical and highly professional applicability. the email must to include "issue: work offer", explaining the work offered and contact information. is designed to re-awaken our own innate curiosity; back roads of sensations, movements, thoughts and feelings reaching a highly articulated and efficient operation. This method uses movement as a basis for learning to enrich our nervous system. Educate the kinesthetic sense, clear body image and leads to a more accurate body awareness. Creates the basis for phasing tensions, pains, stress ... Enabling us to make better of ourselves. The Feldenkrais Method is named after the doctor who created Moshe Feldenkrais (1904-1984) Engineer and Physicist, Ph.D. in DC Physics at the Sorbonne (Paris). A sports injury led him to put on your body their scientific expertise and experience in the martial arts develops organic learning method based on the nervous system's ability to evolve and improve its mechanical function. What pathologies do we treat? All our students from the third year of study in EOM to be abble to practice with patients in our clinics. Today We have two: Clínica Escuela de Osteopatía de Madrid in Madrid, Spain, and the EOM Department of Osteopathy in the Campinas Hospital in Campinas, Brazil. We will open more clinics in a near future. Hospital Agreements between EOM and hospitals in Brazil for the care of patients and for student practices in their last years of training.